The Michigan House seat previously occupied by longtime Congressman John Conyers, who retired last year amid sexual harassment allegations, is likely to go to former state Rep. Rashida Tlaib. 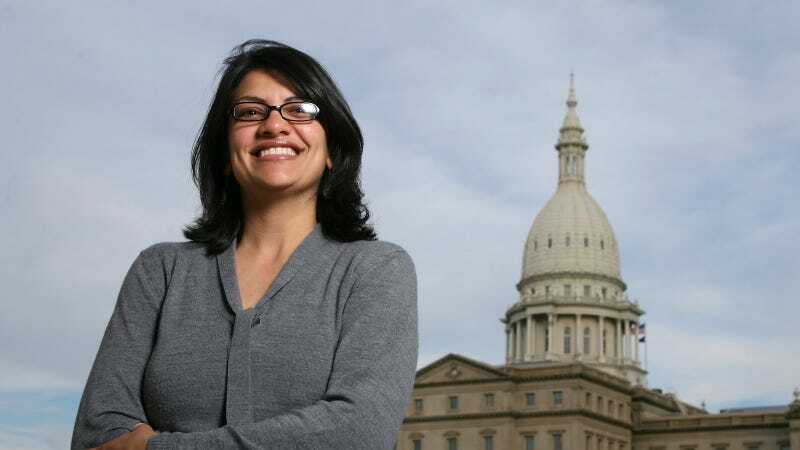 There are no Republicans running against Tlaib in the District 13 House race, meaning that she is poised to become the first Muslim woman, and first Palestinian-American woman, in Congress. Michigan also advanced former state senator Gretchen Whitmer in the gubernatorial primary race. Whitmer’s nomination, along with Democratic state Sen. Laura Kelly’s in Kansas, means that 11 women have now been nominated for governor in the primaries—the highest number of women ever nominated for the position. While Hillary Clinton-backed Whitmer supports progressive measures like raising the minimum wage to $15 per hour and offering residents two-years of debt-free college, she was less progressive than Bernie Sanders- and Alexandria Ocasio-Cortez-backed Dr. Abdul El-Sayed, who, unlike Whitmer, supported single-payer healthcare. After elections across Kansas, Michigan and Missouri, the Center for American Women and Politics report that at least 182 women have won nominations in major parties across the country, the highest ever. However, even if women gain more seats in Congress this year, representation is still likely to fall short. Women currently make up about 20 percent of Congress. “With record levels of women running this year, we are hopeful that we will see gains in the proportion of women in Congress in 2019, but there will still be much progress left to be made to achieve gender parity,” Deborah Walsh, director of the nonpartisan Center for American Women and Politics, told Politico.